Growth in India's manufacturing sector eased to a nine-month low in August as export orders fell for a second month, underscoring the risks to the wider economy from Europe's debt crisis, a business survey showed on Monday. There is no respite in the trade slowdown with exports in July falling by 14.8 per cent to $ 22.4 billion, mainly due to the demand slowdown in the United States and Europe. 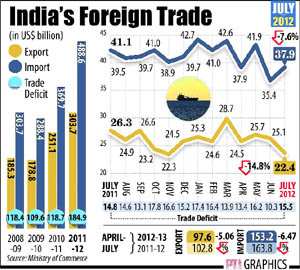 Reflecting slowdown in the economy, imports too declined by 7.61 per cent to $ 37.9 billion in July, leaving a trade deficit of $ 15.4 billion. Exports have been falling for three months in a row now with the developed markets showing no major recovery. 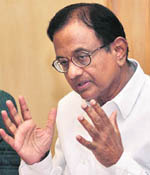 Finance Minister P. Chidambaram said Monday government will provide a tax regime that was “stable” and a tax administration that was “nonadversarial”.“We’ll ensure there is a stable tax regime, there are stable tax laws and everybody adopts a nonadversarial approach to tax collection,” he said after a meeting of senior officials of the income tax department. The guidelines for 2G cellular licences that are to be issued to operators who will win spectrum in the forthcoming auction are set to be finalized by the end of this week. A senior telecom ministry official said the Telecom Commission, which is the highest decision making body for the sector was expected to give its final recommendations over the new guidelines for the auction due in November by Friday. Losses on sale of diesel at government-controlled rates have hit a record Rs 19.26 a litre, sending state-owned oil companies scrambling for ways to cover the mounting losses. Diesel as well as domestic cooking gas (LPG) and kerosene prices have not been raised since June last year even though cost of production has jumped nearly 28%, industry sources said. Hit by the month-long lockout at its Manesar plant, sales of the country's largest carmaker, Maruti Suzuki India, slumped to 40% in August this year as compared to the figures during the corresponding month of 2011. Most car manufacturers reported higher sales in August as compared to the period last year, but the overall sentiment remained low due to the prevailing high interest rates and fuel costs. The Reserve Bank of India is expected to keep its key interest rate steady this month, a Reuters poll showed, and economists see only a slight easing this calendar year, pointing to hawkish comments from policymakers concerned over high inflation. The HSBC manufacturing Purchasing Managers' Index (PMI) eased for the second month to 52.8 in August, its lowest level since November, from 52.9 in July. However, it has kept above the 50 mark that divides growth and contraction for more than three years. "The momentum in the manufacturing sector eased further on the back of weak external demand and output disruptions caused by the major power failures in early August," said Leif Eskesen, economist at HSBC. Any slowing in the manufacturing sector, which accounts for a little over 15% of India's gross domestic product, does not bode well for the overall economy, especially as this sector has been the biggest drag on growth. The Indian economy grew 5.5% in the quarter to June, languishing near its slowest pace of growth in almost three years, data showed on Friday. With no concrete signs of a resolution to Europe's debt crisis, the new export orders subindex — an indicator of prospective overseas business — fell for the second month in a row to 49.2, its deepest contraction since October. The eurozone, India's largest trade partner, has been ravaged by a debt crisis that began in Greece and appears to be hurting growth in heavyweight economies like France and Germany, posing further risks to the Indian economy. While domestic orders helped increase output in August, the pace of expansion was the slowest since November. The lone bright spot among the survey's otherwise gloomy data was that new jobs were created at the fastest pace since the series began more than 7 years ago. Commenting on the trade data released Monday, FICCI president R.V. Kanoria said the decline in exports for the third consecutive month this fiscal — from 4.16% in May to 14.8% in July — reflects only in part the continuing decline in global demand. He added one of the main causes of concern was the need to bring back competitiveness in the economy and also to stimulate investments which are concomitant to building durable trade relationships. 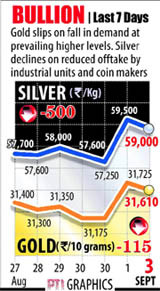 Also, Indian exporters are also under pressure due to high cost of credit, Kanoria said. Federation of Indian Export Organizations (FIEO) president M. Rafeeque Ahmed said the dip in export growth is primarily on account of sluggish global conditions and slowdown in domestic manufacturing. He said that while European Union is still a cause of concern for exporters, the indications from US are positive and situation will improve by October giving a push to Indian exports. Ahmed added the government needed to look into the cost of credit which is adversely impacting both exports as well as manufacturing. “Moreover, with contraction in demand, more focus should be on aggressive marketing for which government should provide marketing support. While reduction in imports is encouraging, one needs to look into the profile of such imports so that decline in imports should not have affect on domestic manufacturing sector”, he stated. “I’ve asked the department’s chief commissioners to adopt a nonadversarial approach to tax collection and told them to repeat this message to all commissioners, assistant and deputy commissioners and ITOs,” he said. He asked the people to “pay taxes and hold their head high” and said “there is no need to unnecessarily fear the income tax department which will be friendly, helpful and interactive”. Chidambaram said the government will look into several sectors and industries that are paying corporate tax at much below the average of 24%. Though he did not name these sectors, Chidambaram added that if tax collections can be increased by an average of 2% it can lead to a mopup of over Rs 30,000 crore. Corporate taxes amount to 65% of total direct tax collections, of which 6,000 companies pay 90%. On the Vodafone tax case, he said that there will be no “rash” action and the matter will be decided after considering all aspects including recommendations of the Shome committee on indirect transfer of assets. “The IT assessing officers and are not going to act rashly. There is the Supreme Court judgement, the Attorney General’s view and by the time the Shome committee will also have come. These are not small amounts on which you can take a rash decision,” he told reporters. The minister expressed confidence that the direct taxes collection target of Rs 5.70 lakh crore for the current fiscal will be met. He informed that the collection is growing at 10.5% against the asking rate of 15%, which is likely to improve in the second half of this fiscal. Trying to dispel the perception that taxes are high in India, Chidambaram said India has lower tax rates than other countries and there is a need to improve the tax to GDP ratio. “The aim is to improve the tax-to-GDP ratio to 12%. This ratio has come down to 10.1% from 11.9% in 2007-08 due to the economic slowdown”, he added. The guidelines for 2G cellular licences that are to be issued to operators who will win spectrum in the forthcoming auction are set to be finalized by the end of this week. A senior telecom ministry official said the Telecom Commission, which is the highest decision making body for the sector was expected to give its final recommendations over the new guidelines for the auction due in November by Friday. Telecom Commission chairman and telecom department secretary R. Chandrashekhar said: “By Friday we expect the commission’s final recommendation s in respect of unified licences in all aspect that will be relevant for the purpose of the auction will be available”. Among the aspects that are expected to be finalized are the type of licences that will be given to new players for their service areas, eligibility conditions, services allowed under the new licences as well as things like entry fee, financial bank guarantee and performance bank guarantee. According to the guidelines of the latest national telecom policy, the new licences will do away with different kinds of permits that are issued to telecom companies for offering various services. Also the new licences would not come bundled with spectrum, as has been the case in the past. The Telecom Commission, which met here Monday, also decided to postpone the decision on the issue related to migration of licences of existing players and bringing cellular tower firms under the licensing regime. Chandrashekhar said of the several recommendations received by the panel it was decided that priority and focus should be on those which require immediate decision in the context of the 2G spectrum auction. Losses on sale of diesel at government-controlled rates have hit a record Rs 19.26 a litre, sending state-owned oil companies scrambling for ways to cover the mounting losses. Diesel as well as domestic cooking gas (LPG) and kerosene prices have not been raised since June last year even though cost of production has jumped nearly 28%, industry sources said. 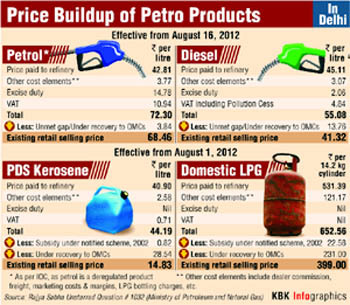 Indian Oil Corp, Hindustan Petroleum Corp and Bharat Petroleum Corp are losing close to Rs 560 crore per day as they sell diesel, domestic LPG and kerosene way below cost to keep inflation under check. Sources said diesel is being sold at a loss of Rs 19.26 a litre, kerosene at Rs 34.34 per litre and domestic LPG at Rs 347 per 14.2-kg cylinder. Losses on diesel are the highest ever, beating Rs 16.16 a litre loss that oil firms incurred in the first half of April. 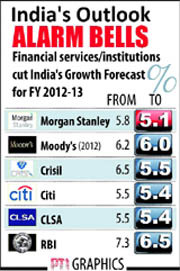 At current rate, the three firms are projected to lose Rs 1,92,951 crore in revenues in this fiscal, the sources added. In addition, they lose about Rs 4.85 a litre on petrol sales, even though prices were freed from government control in June 2010. The sources said if prices are not hiked, the government will have to come up with other ways to compensate the oil marketing companies for their losses. Hit by the month-long lockout at its Manesar plant, sales of the country's largest carmaker, Maruti Suzuki India, slumped to 40% in August this year as compared to the figures during the corresponding month of 2011. Most car manufacturers reported higher sales in August as compared to the period last year, but the overall sentiment remained low due to the prevailing high interest rates and fuel costs. Maruti Suzuki said it sold 54,415 units last month as against 91,442 units sold in August 2011. Maruti sold 3,085 units of Dzire and 6,059 units of compact cars (Swift, Estilo and Ritz) last month down from 7,856 units and 16,043 units, respectively, sold during August last year. The country's second largest car-maker, Hyundai Motors India, posted a 5.9% growth in domestic sales for August. The domestic sales accounted for 28,257 units compared to 26677 units for the same month last year. Automobile major Mahindra & Mahindra announced it had logged a 22% sales growth at 45,836 units in August this year. The Indian subsidiary of US auto major Ford Motor said it sold 7,840 units in the domestic market, up from 7,382 units sold in August, 2011. In two-wheeler sector, sales of the world's largest two-wheeler manufacturer, Hero MotoCorp, dipped in the past few months after it dropped the Honda tag from its motorcycles following a split with its Japanese partner of 26 years. In August, the company's sales stood at 4,43,801 two-wheelers units against 5,03,654 units in the corresponding month last year, a decline of almost 12 per cent. Bajaj Auto reported 10% fall in motorcycle sales at 3,04,352 units in August. The company had sold 3,38,054 units in the same month last year. But in Hero MotoCorp's case, the experts say the change in name has negative impact in the sales figure as major customer base from rural areas are not happy with the firm's this decision.